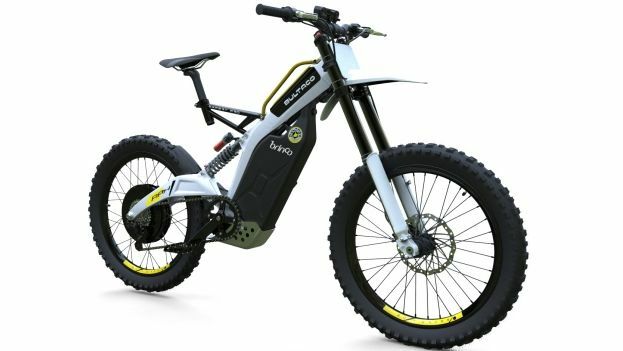 The Spanish motorcycle manufacturer, which once crafted some of the most exquisite off-road two-wheeled machines in the world, is back but with an all-electric contraption that will have a few fans scratching their heads. The Brinco is a 100 per cent battery-powered bicycle that can either be pedalled or, with a flick of the wrist, propelled by the on-board 3kW motors at speeds of up to 37mph. Don't expect to be throwing the Brinco over your shoulder and tackling a challenging cyclocross route anytime soon because it weighs a whopping 33kg, but it does produce an impressive 60Nm torque (great for wheelies) and boasts a range of 100km on a single charge. Charging takes just two hours from a standard domestic plug socket. The aluminium frame is designed to hit the trails - as long as there is no lifting required - and is based on a modern downhill mountain bike. It features two independent suspension systems, upside-down forks at the front and a Piggyback Monoschock unit at the rear, while braking is taken care of by serious discs and four-piston calipers. Users can also pair a smartphone to the Brinco and easily access the remaining battery charge, as well as geographically locate the so-called moto-bike from anywhere in the world via an optional on-board sim card. Distance, speed and energy consumption can also be pulled up on a bespoke app, while the business of locking and starting this beefy bike is taken care of by a NFC-enable wristband, doing away with keys entirely. Only 175 Bultaco Brino moto-bikes will go on sale next year, each sporting a price tag of £3,756, so it might be worth sticking to the rusty Raleigh in the garage.